With the continued decline of global forest resources and the exacerbation of global climate change, the sustainable management of forest has become a global hot issue. Today, many Asian countries are facing the problems of the loss of biodiversity, degradation of forest resources and the challenges of sustainable forest management. At the same time, like other parts of the world, these countries' correlated traditional knowledge of forest management and protection is rapidly disappearing. In order to save forest and maintain the environmental services provided by forests, traditional forest-related knowledge and culture must be understood, admitted, respected and protected. Asia has a long history of human civilization of which forest civilization is an important component. When facing the continuous acceleration of globalization and the further expansion of the market economy in the new century, the challenges we face are how to maintain the sustainable development of Asian forest-related culture, including keeping the respect of nature and the practices of modern forestry. Sustainable forestry should be put on the urgent agenda by all Asian countries. A better understanding of the traditional knowledge and culture will play a significant role in the social development and contribute to the forest management and protection. 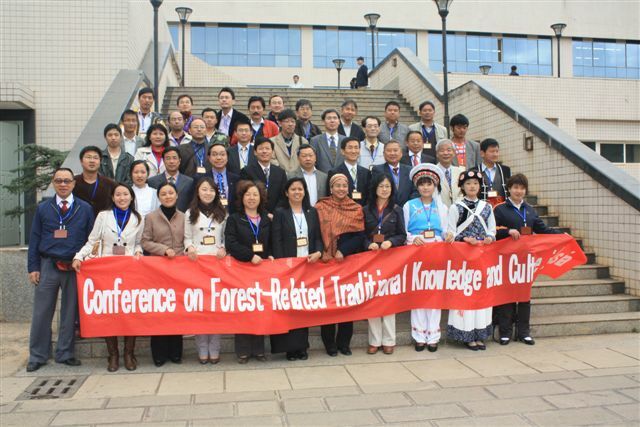 The First International Conference on Forest-related Traditional Knowledge and Culture was successfully held in Seoul by South Korea's Forest Research Institute, Seoul National University and Korea Institute of Forests and Culture from September 5th to 10th, 2008. The second conference was held in Kunming and Xishuangbanna, Yunnan, China, by Kunming Institute of Botany of CAS cooperating with Yunnan Green Environment and Development Foundation, the United Nations University, the National Plateau Wetlands Research Center, National Park Development Institute of Southwest Forestry College, Xishuangbanna Tropical Botanical Garden of CAS, the Asian green culture International Exchange Promotion Association and the US-China Arts Exchange Center of Columbia University, from November 2nd to 6th, 2009. The objectives of the meeting were: further promoting the role of Asian forest-related traditional knowledge and culture in the continuous management and protection; discussing, researching and establishing the strategies, methods and means of protecting forest culture and traditional knowledge; enhancing the network connection of regional academic groups and individuals in the aspects of forest culture and traditional knowledge and biodiversity conservation and rural development research. The meeting was held in the Academic Lecture Hall of Southwest Forestry College on November 2nd and 3rd. The meeting has received 24 thesis abstracts and 24 experts made speeches at the meeting; 51 representatives respectively from <?xml:namespace prefix = st1 ns = "urn:schemas-microsoft-com:office:smarttags" />Japan, Korea, Malaysia, Thailand, the Philippines and China attended this meeting. 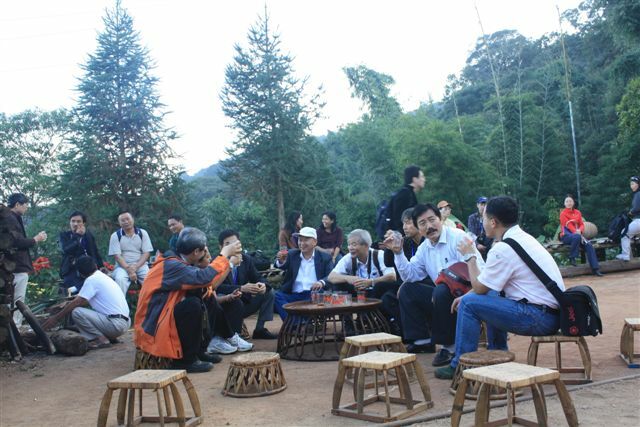 The conference was divided into the following topics for discussion: tradition knowledge and sustainable forest management; Asian traditional culture and forest protection; the role of traditional culture in the Sacred Nature; Natural Reserve and National Park management; related policy issues of traditional forest culture and its protection. Three work units presented their research results and conservation activities in the form of poster and display panels. The deputy Secretary-General of the Yunnan provincial government and the director of provincial government Research Office Tong Zhiyun attended the meeting and made speeches. The deputy director of Yunnan Provincial Department of Culture Fan Jianhua made a report entitled 'Culture and Forests Conservation'. The director of Kunming Institute of Botany Li Dezhu and vice president of Southwest Forestry College Yang Yuming made welcome speeches. President of the Conference Organizing Committee and professor of KIB Pei Shengji made opening speech. The collection of conference theses is published. After the meeting, the representatives visited the Southwest China Germplasm Bank of Wild Species, Kunming Botanical Garden and the Ethnobotany Laboratory of Kunming Institute of Botany of CAS. From November 4th to 6th, 29 delegates at home and abroad conducted field visit in Xishuangbanna and visited Xishuangbanna National Nature Reserve Museum, Menghai County Nannuo Mountain traditional tea garden, Xishuangbanna Tropical Botanical Garden of CAS, Dai village ridge mountains and temples, etc. According to the assessment of delegates, 90% of the representatives considered that this meeting was quite successful. The Third International Conference on Forest-related Traditional Knowledge and Culture of Asia will be held in Kyoto, Japan and Kyoto University will organize and host the conference. However, some delegates reckoned that the meeting also was inadequate. The main problem was that the range of topics discussed at the meeting was wide but too dispersed. The successful holding of this meeting can not be done without the strong support of various units. We need to especially express our sincere gratitude to Yunnan Green Environment and Development Foundation, the United Nations University, the National Plateau Wetlands Research Center, National Park Development Institute of Southwest Forestry College, Xishuangbanna Tropical Botanical Garden of CAS, the Asian Green Culture International Exchange Promotion Association and the US-China Arts Exchange Center of Columbia University. A total of 7 foreign delegates and 6 domestic delegates were funded to participate in the meeting and the investigation.